Live in New York? Register for my Class! 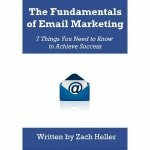 It’s official, I’m teaching my first SkillShare class on The Fundamentals of Email Marketing on January 25th here in New York City. The team at SkillShare has been kind enough to lend me some space to host this course. Seating is limited to a total of 30 students, and space is running out fast. If you’re interested in attending, the cost is $20. You can register here. If all goes well, I will teach additional classes here in New York City. And if I happen to spend significant time in other parts of the country with a SkillShare presence, maybe you’ll find this show on the road. Thanks for your interest, and I hope to see you there!